Have you been looking after the kids for the past few years? But now they are growing up and you’re itching to get back to work? Returning to work after you’ve been a full-time parent can seem intimidating. Everyone’s constantly talking about the cutthroat job market, what chance do you have? And how can you ever create a resume – you can’t list fixing breakfast as a skill, can you? Fear no more! With the right resume, you can get your job hunt sorted and get ready for work. Here are the tips for sorting out your resume and getting yourself back on the career ladder. Before you start worrying about your resume, you should define what kind of roles you are looking for. Best resumes are tailored to the role and you can’t be effective with your job-hunting if you don’t know what you want. It’s extremely hard to create a successful resume with the simple premise of wanting a job, any job. What job exactly? The resume to become a brain surgeon or a waitress will look different. Am I going to be picking up the career I left behind when I started the family? Am I going to be looking for a career in something completely new? Knowing which one you are doing will help you pick the right resume format. It makes listing the right skills, qualifications and accomplishment easier. You know if you’ll be working with things you’ve already done in the past and relying on your previous work experience or if you need to emphasize transferable skills. Resumes come in all shapes and sizes. But as mentioned above, the most important thing is to tailor it based on the job and your current experience and skill level. If you don’t consider these two things, you’ll end up with the hiring manager’s nightmare – a resume with no focus or soul. They have no real previous work experience (I didn’t really get into the career ladder). Below are tips for each situation and a quick resume format to follow. If you worked for a long-time prior to staying home with the kids, you can use a combination resume or even opt for your average chronological resume. You’re in a strong position – your past experience will be to your advantage even though you’ve taken a bit of time off. In order to address this short time gap, you could opt for the combination resume. On the other hand, you might have just a sliver of experience. You should definitely use this to your advantage in the resume. If your experience is not directly related to the field you want to get into, you can focus on the transferable skills but also highlight any relevant education you may have. You might have, of course, spent most of your adult life as a full-time parent. It might be that you don’t have any real valuable work experience and even your education might be limited. You still have options to make your resume look good! In these circumstances, you need to focus on utilizing any volunteering work you’ve done during your time at home. You should also consider adding any freelancing work you might have done – even if it’s something like selling old baby clothes on eBay. Now, if you’re lacking in education, you can place the relevant skills first and mention your education at the end. If you don’t have notable experience or education, it’s vital to boost your resume by gaining either experience or skills. You can find out how to bolster your resume in the following sections. No matter what kind of resume format you’ll end up using, you don’t want to try hiding your employment gap. There is no point in trying to pretend it isn’t there. There isn’t anything wrong about taking time away from the career ladder and looking after a family. When you are returning or looking to return on the career ladder, the best bet is to be honest and upfront about having been off the ladder for a while. You should definitely include a summary paragraph to your resume and use it as an opportunity to briefly mention your current situation. You can use the section to outline your intention to return to work after staying at home with the children. Most hiring managers will tell you having a family won’t really work against you – there are much worse reasons to have an employment gap in your resume. Now, your resume doesn’t have to be the only place to talk about the employment gap. You can also bring it up in your cover letter. This can allow you to be more detailed about your situation and write a more in-depth section about the benefits of having stayed at home in terms of returning to work life. Whilst domestic duties and looking after kids are hugely valuable things and they teach many important life lessons, don’t try using them as skills on your resume. People have sometimes written things like “CEO of the Family” to their resume but this won’t impress the hiring manager. In fact, it looks rather silly and it’s not a professional way to talk about your time as a stay-at-home parent. “More galling are the claims that women make about the critical role they played – with my favorite being the one who ‘spent seven years looking after my two children who need and deserved my attention’”. The point the hiring manager is making is not that the work you have done isn’t valuable but, as she put it, you shouldn’t “put this kind of waffle on your CV”. There are other ways of focusing on your transferable skills. Now, the above doesn’t mean you shouldn’t use transferable skills to benefit your resume. As mentioned earlier, transferable skills are a wonderful way to talk about your skills and to highlight your suitability for the role. The key is to avoid using clichéd job titles or listing your skills as purely domestic (such as doing the laundry, for instance). You definitely want the focus to be on skills and achievements you’ve done outside of your domestic life. The truth is you’ve probably been involved with many projects you just didn’t necessarily count as valuable things to put on your resume. The correct way to do it is to focus on highlighting those skills and qualifications that help you in your professional life. For instance, take the skill all employers love: organizational skills. You might have been in charge of the school’s baking sales or you’ve volunteered for the sports club and helped organize tournaments. These situations showcase this valuable transferable skill. It’s important to utilize these in your resume. If you’ve also held an un-paid or unpaid position in an organization, such as the school’s parental board or the board of the local sports club, then you should also list this on the resume. These kinds of roles show you’ve been a respected member in the community, you’ve taken responsibility, and you’ve been in a leadership position and so on. You add more context with the latter example and you give a more tangible proof of your finance skills! Of course, the key here is to make sure you’re not lying – you can’t make up those numbers. But a lot of this information is probably available to you. It is possible to look at the earnings, percentages or the timeline of events. What if you feel like you still didn’t have those types of experiences? Maybe you stayed home looking after triplets or cared for a special needs child and you just didn’t have time to sit in the school board or organize sports clubs. You should be upfront about this in the career object or executive summary. Furthermore, it’s a good idea to talk about the soft skills – you’ve probably noticed an improved skill to broker conflict resolution between warring children and getting along with all sorts of people from doctors to teachers. Things like communication skills and negotiating skills are something employers are always looking for. The above tips will help you format and edit your resume. But you might still feel it is lacking in content – it can seem hard to find relevant transferable skills and if you’ve stayed at home for most of your adult life, you might find your experience just isn’t there. Don’t worry; there is a final way you can improve your resume. You can bolster and broaden your skill set. Being a full-time parent doesn’t mean you can’t do anything else, especially if your kids are growing up and they don’t need as much attention. You could start your march back to work by taking up a volunteer role or simply working part-time. This gives you a chance to build up your resume and it gives you a softer landing back to working life. Udemy.com – courses ranging from marketing to music. Futurelearn.com – courses ranging from psychology to accounting. Edx.org – courses ranging from business to language studies. Coursera.org – courses ranging from data science to programming. Now, certain courses online and offline might provide you with official certification, which might be useful in your career. These certificate programs are often not as intensive as full-time studies and you can take them while staying home to look after the kids. So, if you are planning to get back to work, you might want to consider enrolling on a course like this. 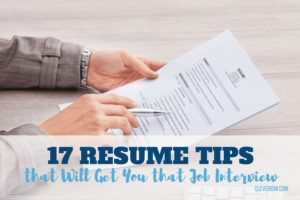 You could do it a few years before you think you’d start looking for a job – a great way to prepare your resume! Don’t be daunted by writing the resume when you’re a full-time parent returning to work. There are many things you’ve probably done while staying at home and as the examples above show, numerous ways to boost your resume. The most important thing is to stay honest and avoid clichéd statements about your time at home. Focus on transferable skills and pick the resume format that best highlights your strongest points. You want to ensure you address the gap by showing how you’ve kept updating your skills and stayed active even though you haven’t been on the career ladder. This will help you create a resume that’ll land you a new job!